Four decades after the passage of the Clean Water Act, regulators haven’t kept up with the pollution pressure that growing populations put on America’s shorelines. This article was reported with support from the National Health Journalism Fellowship, a program of the USC Annenberg School for Communication and Journalism. Hidden amid the pleasure boats and cargo ships that roar through the canal in northwest Seattle is one of the oldest fishing economies in North America. From midsummer to October, from early morning until after dusk, fishermen from the Suquamish Tribe zoom up and down the canal in orange waterproof overalls, tending to salmon nets that dangle across the water like strings of pearls. The tribe holds reservation land about ten miles west of the city, on the far side of Puget Sound, the 100-mile-long estuary that extends from Olympia, Washington, north to the Strait of Juan de Fuca. The Suquamish are one of more than a dozen tribes that have fishing and shellfish-harvesting rights all across this region, and their fishing traditions, which are thousands of years old, predate all of the oldest shipyard industries here. The sale of fish caught here contributes to basic living expenses for the fishermen—and some of their catch becomes food for their extended families and circles of friends. According to one survey, the average Suquamish tribal member eats fourteen pounds of fish and shellfish every month (about as much as the average American consumes over a whole year). But this way of life is fragile next to a city like Seattle. The sound’s slate blue waters hold one of the most diverse ecosystems in North America; even in the heart of the city there are multitudes of fish and shellfish, which feed resident populations of orcas, seals and sea lions and support a multimillion-dollar commercial fishing industry. But Puget Sound is in “critical condition,” according to a state agency that monitors ecosystem health. When I ask Pratt how water quality affects people like him, whose lives depend on fish, he narrows his eyes. “What water quality?” he asks, his face wizened and skeptical. “Put your net in, and it comes back covered” in sludge, he says. “It’s like cobwebs, except it’s brown. It’s progressively been getting worse all the time—last thirty, forty years.” The fishermen carry tennis rackets with them in the boats; they slap them against the nets to knock the muck off—otherwise the salmon will steer clear of the grimy mesh. Ringed by the white-capped Cascade and Olympic Mountains, Puget Sound looks pristine. But four decades after the Clean Water Act passed in 1972, regulators haven’t kept up with the pressures of growing populations near America’s shorelines, here or elsewhere in the country. The sound is choking with the waterborne residue of the urban existence of 4 million people—engine oil, traces of gasoline and paint, lawn fertilizer, chemical flame retardants from furniture, lead and copper from old roofs, and other kinds of grime wash into the water every time it rains—a problem collectively known as storm-water pollution. Near the canal, the city has been scrambling to reduce spills from a century-old sewer and storm-water system that frequently overruns during storms—fifty-eight spills in 2013 and cumulatively almost 15 million gallons of raw sewage. As the population of the Seattle area has boomed, storm-water has become the number one source of toxins in the Puget Sound. All of this contamination becomes part of the stew that fills Puget Sound, the water in which fish swim and shellfish grow. And the people who rely on fish are among the first to feel the impacts. Sometimes the pollution is enough to kill salmon before they can spawn and make shellfish harvests either inedible or unmarketable, putting the fishing economy at risk. Tribal commercial fishing brings tens of millions of dollars of revenue into this state, but more than one fisherman told me it’s becoming increasingly difficult to make a living from the declining stocks of salmon in Puget Sound. Pollution is one of the many likely reasons that some fish have low survival rates in the sound, along with the destruction of important habitats, such as wetlands. “Salmon recovery is failing because habitat is being damaged and destroyed faster than it can be restored and protected,” says Tony Meyer, a manager for the Northwest Indian Fisheries Commission, a tribal natural resources agency that works on fish conservation. But giving up local fish is not a viable choice for any of the people who cast nets and lines, crab pots and clam-digging forks into Puget Sound. American Indians are more likely to live in poverty than most other ethnic groups. “To tell them not to eat locally caught fish—you’re just basically telling them not to eat protein,” Dunn says. The traditional native diet in this region has always been loaded with crabs, clams, oysters and salmon. High in omega-3 fatty acids, fish is an antidote to many of the epidemic health problems, such as diabetes and heart disease, that afflict reservation communities. “Tribes would eat even more fish and shellfish if they could,” says Meyer. For communities like this, fish is the most affordable, healthiest thing for dinner. The story of water pollution in Puget Sound mirrors that of other urban areas in the country. In the mid-twentieth century, the damage caused by waste and industrial pollution became obvious. Though less stark here than in places like the Cuyahoga River in northeast Ohio, which caught fire in 1969, the Seattle region has had widespread pollution problems: pulp mills dumped toxic waste straight into Puget Sound, and during the World War I and II eras, heavy industry, including the Boeing Company, expanded throughout the region; those manufacturers released PCBs and heavy metals like arsenic and lead onto the surrounding land. In the 1970s, scientists found fish in Seattle waters with liver tumors, fin rot and other diseases, stirring public fear and outrage. 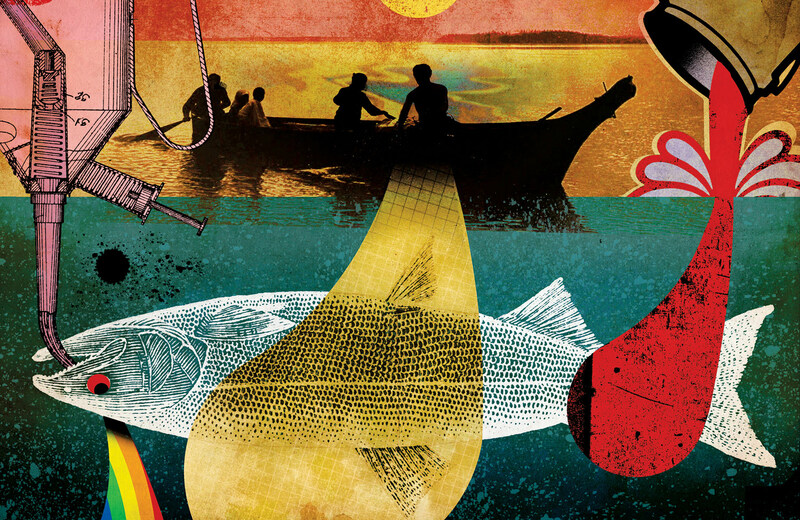 Protecting fish has long been a cultural and economic imperative here, especially for tribes, who fought for more than a century for the legal recognition of their right to fish all over Puget Sound, from the heart of the city to the most remote beaches. When the federal government brokered treaties in the nineteenth century that took possession of millions of acres of native land in the Northwest, it left tribes with the right to fish in all “usual and accustomed” areas. But the State of Washington often failed to honor these rights, and wardens harassed or arrested tribal fishermen. In the 1960s and ’70s, at the same time that the state began forcing industries to treat their wastewater, tribes staged demonstrations and “fish-ins” for fishing rights. In 1974 and 1994, two federal court decisions upheld Northwest tribes’ rights to half of the harvestable fish and shellfish in all of the areas they traditionally used. In 1972, the Clean Water Act became law, giving states tools to target what were the worst sources of pollution at the time, especially industrial waste and city sewage. From the 1970s and ’80s onward, the act forced both industrial polluters and sewage treatment plants to use new technology to treat and control pollution, and the amount of heavy metals and other contaminants in Puget Sound began to decrease. Tribes and environmentalists have used the Clean Water Act and other regulations to fight for measures to restore fish habitats. In the last decade, Washington State has reopened thousands of acres of shellfish beds, and shellfish harvests and exports now bring millions of dollars of revenue to tribal communities. Across the United States, the Clean Water Act has succeeded in restoring rivers, lakes and wetlands. But the goal—cleaning up America’s waters—has never been fully realized. Enforcement of pollution standards on industries has become more lax in recent years, as research by Oregon Public Radio, Earthfix and the journalism organization InvestigateWest has shown. And the law has done little to rein in pollution that is generated not just by heavy industry but also by individuals: the dirt and contaminants from city streets, lots, houses and lawns that flow into lakes, beaches, bays and rivers when rain sends water rushing across a landscape. Runoff worsens the more developed an area becomes. More households mean an increase in the number of septic tanks, car washes, golf courses, lawns and streets that can produce contamination. As the population around Puget Sound has ballooned—by more than 90 percent in the central part of the region in the last four decades—the region has witnessed an upswing in these sources of toxic pollution. Storm water is now the leading source of toxins in the sound. Clams, mussels and resident fish steep in chemicals released into the watershed, including some new and dangerous substances such as flame retardants used in furniture and endocrine disruptors like bisphenol A. Mussels in some parts of Puget Sound are loaded with higher concentrations of polyaromatic hydrocarbons (a class of toxins that comes from oil) than anywhere else in the country. Chinook salmon have elevated levels of PCBs, industrial chemicals that were banned in 1979 but still linger in the soil and pass into water during storms. And since runoff comes from many small sources, targeting it often requires fundamental changes in the way landscapes are developed. Rain should be able to sink into the soil and the groundwater, the way it does in a forest or a meadow, instead of becoming a moving vehicle for gunk picked up from streets, roofs and parking lots. In 1987, Congress amended the Clean Water Act to require industries and municipal wastewater plants to apply for permits to release urban storm water and make plans to control pollution. But state agencies are responsible for overseeing those plans, and storm-water standards aren’t consistent from one state to the next. The requirements are more stringent for cities with populations over 100,000. But for smaller communities, “the rules are terrible,” Hasselman says. “They leave so much discretion to local communities that are just ill-equipped to deal with this and don’t really have a lot of motivation.” The problems of storm water are worsening in many parts of the United States: a combination of polluted storm water and farm runoff helped create the Chesapeake Bay’s “dead zones,” where few or no fish can survive, and the algae blooms that rendered Toledo, Ohio’s water supply undrinkable last summer. In many older cities, including Seattle, storm water contributes also to sewage spills. Where cities have combined sewers and storm drains, as in Seattle, storm water pours straight into the sewage-treatment systems, where it can cause backups that spew bacteria and waste, human and otherwise, into places like the ship canal. More than a decade ago, Seattle was one of several cities that pioneered water-friendly “green engineering,” including rain gardens and porous pavement that allows rainwater to soak into the ground instead of flushing across concrete and gushing into storm drains. In 2012, after a lawsuit brought by an advocacy group called the Puget Soundkeeper Alliance, the state updated its construction permits for big and midsize cities—by 2015, any new buildings or developments there will have to use green engineering strategies. In some cases, larger cities are even required to re-engineer some streets and lots to capture more rain. But the requirements for smaller towns and suburbs are fewer and looser. Despite Puget Sound’s water quality troubles, Washington’s rules for storm water are progressive compared with standards in many states. In the Seattle area, both the city and county governments have invested heavily in projects to control storm water, as have numerous other major cities across the country, including Philadelphia, New York and Portland, Oregon. Most of these cities encourage green building practices. Still, “it’s so far from the scale that’s required to really get a handle on the problem,” says Hasselman, “because the vast majority of the developed landscape today was built without any recognition of this problem.” Rebuilding streets and sewer systems and re-engineering urban landscapes will require many years and billions of dollars. Meanwhile, the storm-water problem may worsen before it gets better, as urban areas across the country grow. And wherever climate change brings heavier storms and more flooding, there may also be more pollution. But environmental groups say the agency itself needs to create better and more consistent storm-water standards for the entire country. “The fact that [the EPA] has decided not to move forward doesn’t diminish the importance of solving this problem,” says Rebecca Hammer, an attorney with the Natural Resources Defense Council. In December, the NRDC and the Environmental Defense Center filed suit to force the agency to strengthen storm-water regulations for smaller cities. In Puget Sound, progress seems to happen in small increments. Across the state, tribes have fought for an increase to a water quality standard called the “fish consumption rate,” which uses an estimate of how much fish people eat to determine what levels of pollution can remain in the water. For years, that estimate has been an order of magnitude lower than the amount tribes actually eat. The governor’s office recently released updated guidelines, but a spokesperson for the state acknowledged that the new rules, as written, will have little effect on the industrial polluters and do almost nothing new to stop storm-water pollution. An alternate approach could prove more successful: in January, Governor Jay Inslee proposed a bill that would create a “priority” list of toxic chemicals and constrain, ban or phase out their use. Just a few years ago, many of the beaches around this inlet were too polluted to yield edible shellfish. In the early 1990s, the Puget Soundkeeper Alliance sued the nearby city of Bremerton to force it to upgrade its sewer systems and fix its storm-water problems. Since then, the city’s massive cleanup effort has rendered several miles of beaches safe for digs like this. The beaches still close when sewage overflows, but rarely. And though the land around the inlet is urbanizing rapidly, local agencies are working to keep new construction from making water pollution worse. The county has a grant to install “green streets,” and a nearby new shopping center will build underground storm-water ponds to keep pollution from sliding into the inlet. He turns to call to a woman who has been watching him dig. “How are you doing, Ivy? Is that enough?” George shouts to Ivy Cheyney, a fellow tribal member and elder, then glances at the carrot-colored plastic bucket at his feet, which he has filled to the brim with clams. “I think that’ll do,” she shouts back. This clamming expedition is an “elder dig,” and every clam George is scooping from the sulfur-scented mud is for Cheyney. The Suquamish Tribe planted the clam seed several months ago. Several pounds of clams will be carried home to feed families. (“The grandkids love clams,” one woman tells me.) The rest, up to thousands of pounds, will be sold, with proceeds benefiting the tribal elders. The recovery of these beaches has restored another measure of health to this community, a social and cultural connection to the beach and to one another. I can feel it this morning, as diggers trade smiles and stories. George jokes with one of his friends, whom he accuses of trying to steal his clamming fork. When I ask to take George’s photo, he pulls his adult son into the picture, a muscular man in his 20s who has been digging beside him all morning. “My boy!” George says jovially. Under the trees at the edge of the beach, older women sit around in lawn chairs or play with their grandchildren. A woman named Dolores Mills tells me her grandfather used to fish and her half sister’s grandson dug clams for her today. Does she ever worry about how clean the water might be? She shakes her head. “They keep testing it, so we know that everything will be safe,” she says.